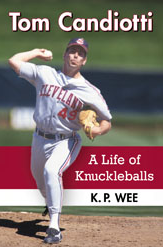 “Tom Candiotti: A Life of Knuckleballs” can be purchased from the McFarland & Company website or through Amazon.com! It’s really easy! GET YOUR COPY OF “TOM CANDIOTTI: A LIFE OF KNUCKLEBALLS” TODAY! WHO IS TOM CANDIOTTI AND WHY IS THERE A BOOK WRITTEN ABOUT HIM? Who is Tom Candiotti? If you watched baseball during the 1980s and 1990s, undoubtedly you have heard of Candiotti, who is currently a color analyst for the Arizona Diamondbacks. He normally works the radio broadcasts but sometimes gets assigned television work as well with the Diamondbacks. He was formerly a knuckleball pitcher in the major leagues. I wrote this book because I wanted to recognize Candiotti for his pitching as well as the struggles he faced in order to get to the majors. His story is one that has been forgotten but I believe can be a source of inspiration and motivation for others. I thought that if he had pitched in the social media era that we are in now, he would have been more recognized the way other athletes are publicized these days. Most sports fans know about basketball player Jeremy Lin having to sleep on a buddy’s couch because he didn’t have anywhere to stay – and that’s because of social media. Candiotti, similarly, had to overcome this situation and also a major elbow surgery, known as Tommy John surgery, to get to the big leagues . However, not many people remember this about Candiotti. I bought this book for my son who is a huge sports fan. He is currently a little league pitcher and when he is off the field, I like to see him read books that he enjoys. I have a hard time finding books that he likes, so I try to stick to the sports books as he seems to like those the best. He really enjoyed this one. While Candiotti wasn’t in his era, he still learned a lot about this legend. Candiotti was an inspiration to him as he came back from tommy john surgery before even entering the league. This story recounts everything that Candiotti did to make it to the top of his game. My son loved it and wants to reread it. I’m hoping to find more books from this author soon, these are such a great read for my son! I really enjoyed this book about Tom Candiotti. It was nice to learn more about him through this story. I was always a fan of his while he was playing and often wondered about his background. The biography is based on information from Candiotti himself along with his managers, teammates, the media and other resources. The author does a great job of putting the story together and I found it to be well-written. I would say that biographies are my favorite types of books to read. I really enjoy getting the more personal side of athletes and what they are going through. This book did a great job of presenting the information and it told Candiotti’s story so well. K.P. Wee is truly a talented author and I hope to read more from him in the future. Search the McFarland website for its vast collection of academic and nonfiction books – including History, Popular Culture, Military History, Sports, and others. For a list of McFarland’s Spring 2014 new titles, click here. Their sports 2014 catalogue can be found here. McFarland also offers certain discounts at various times during the year, so check their website periodically to find out what the deals are – and take advantage of those offers! ….and finally, one more reminder about “Tom Candiotti: A Life of Knuckleballs”… if you’re looking for a baseball biography for yourself or a baseball lover in the family, you know what to do!